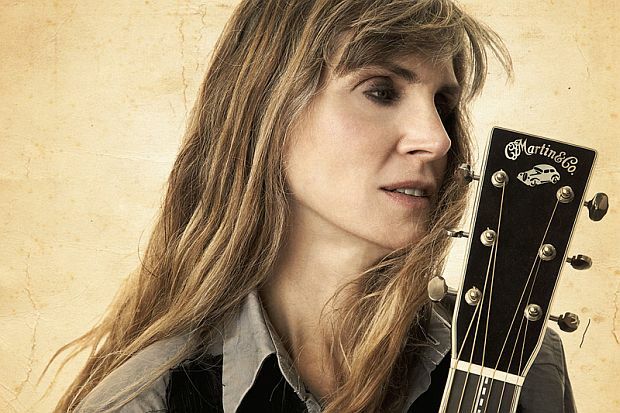 The remarkable guitarist and singer Rory Block has just released her sixth album in her “Mentor Series” for Stony Plain Records. Keepin’ Outta Trouble is a tribute to American country blues great Bukka White a.k.a. Booker T. Washington, who was born 110 years ago on November 12th. Since 2008, Block has released an album for each of her mentors: Mississippi John Hurt, Son House, Rev. Gary Davis, Skip James and Mississippi Fred McDowell. Like the other five albums in the series, Block has written half of the tracks, inspired by White's deeply moving music, which she says “resonated with my heartbeat.” For Block, who met White in 1965 in Greenwich Village, it was a “transformative” experience for the young singer, who was only 16 years of age when she first saw him in a small club: “His face was like a painting. He exuded awesome power and intensity.” It’s that intensity of spirit that charges her new album with passion, resulting in one of the most exhilarating records in the entire series. 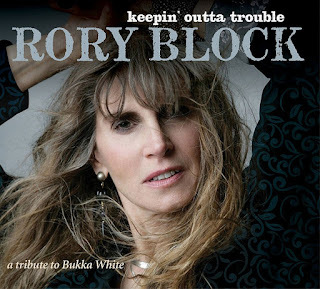 Keepin’ Outta Trouble opens with two Block compositions, the title track and “Bukka’s Day,” featuring Block’s vocals up front with her Martin acoustic. I mention this because Block’s guitar playing is a driving force in all her music. Her particular skill as a guitarist on all her records is often under-recognized in this male-dominated industry. To see and hear her in concert is often mesmerizing. Her skill as a musician is truly something wonderful to behold and unlike the other albums in the series, this one seems the most important. It’s the music that best reflects Block’s intimacy with the blues, and the first two tracks get right to the point, especially “Bukka’s Day” with Block’s multi-tracked voice as the responding choir. We then get the first White cover, “Aberdeen Mississippi Blues,” first recorded by White in 1940. Block follows up with her inspired version of “Fixin’ to Die Blues” – White’s most famous song. (It is also generally regarded as one of the most influential songs for Led Zeppelin, particularly the band’s third album featuring unusual tunings and Americana acoustic songs.) Block’s performance is superb here as she channels White’s style and phrasing. “Fixin’ to Die Blues” is on Bob Dylan’s 1962 debut record for Columbia. Dylan's rendition was partially responsible for White’s comeback two decades after his 1940 recording on the Vocalion label didn’t resonate with a mass audience. The next track, Bock's cover of “Panama Limited,” is a first-rate version of the talkin' blues, one of the most familiar trademarks of White and the country blues sound that influenced both Woody Guthrie and Bob Dylan. “Parchman Farm Blues” is a personal favourite of mine, and I would have liked more thesongs like this on Block’s album. White recorded the song in 1940 on the OKeh label, his first recording following his release from the Mississippi State Penitentiary, where he served two and half years for a shooting incident. While in prison he witnessed the murder of a fellow inmate, as he tells in “Fixin’ to Die Blues.” The album closes with a Block original inspired by a guitar lick of Bukka White on his tune, “Jitterbug Swing.” Block makes that lick her own on “Back To Memphis,” a killer road song that joins the endless tunes about Tennessee’s (and quite possibly, America’s) most important cross-cultural music cities. The Mentor Series really serves any aspiring young musician, male or female, with the all-important groundwork necessary to understand not only country blues, but American roots music in general. Rory Block was mentored in her youth by some of the most important and finest blues the United States has ever produced. Now, at the age of 67 and with the release of this sixth installment of the series, she is the de facto mentor of a new generation of blues musicians to which we should all be grateful. Keepin’ Outta Trouble will be released this Friday.